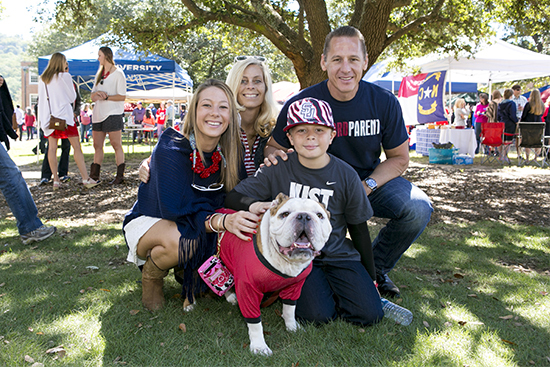 Samford University’s annual Family Weekend kicks off at noon on Friday, Sept. 18. With the theme “Home is Here,” Samford will let parents experience the university like never before. Family Weekend Academy is the first of those events. After years of listening to parents say they wish they could attend class at Samford, Family Weekend Academy finally makes it possible. “We did it because it is easy for parents to participate in sports and arts, but there is no easy access for parents to experience the academic side of Samford,” explains Susan Doyle, director of parent programs. Samford faculty members are teaching a variety of classes similar to what students experience, representing all undergrad schools, during two hour-long sessions. Some have even asked parents to do some homework ahead of time. The sessions will begin at 1 p.m. and 2:30 p.m. on Friday. Although online registration has closed for the weekend, Doyle encouraged parents still wanting to participate to check at registration on Friday for any seats or events that have become available. “A 175-seat class has filled. I think it is indicative of how Samford parents value the academic offerings here and the quality education their students are getting, this is a chance for them to get a taste,” said Doyle. For school-aged siblings, the Tiny Sam Photo Scavenger Hunt will have young family members identifying 30 photos on the university’s Quad. The first prize winner must be present at the football game to receive the Step Sing Weekend prize package that includes tickets, hotel stay and dinner. Scavenger hunt booklets will be available at check-in. Families should also come dressed in their Samford best to have a Christmas card photo taken. The family with the best photo will be chosen by Oct. 5, and provided with 100 free Christmas card prints to send to family and friends. The Samford Parent Association’s pop-up store, Waldo, also will be open this weekend at registration. Known for selling more upscale items, the store will be selling glass-blown Christmas ornaments from Poland depicting Samford’s holiday Lighting of the Way. This year, tailgating has also expanded. Tents representing Birmingham, Nashville, Dallas, Orlando, Jacksonville and Atlanta parent groups will be organized on the Quad on Saturday to bring together families from those areas. Samford’s football Bulldogs will play Southern Conference rival University of Tennessee-Chattanooga at 2:30 p.m. Saturday in Seibert Stadium. The weekend concludes on Sunday with the annual Samford Hymn Sing at 2:30 p.m. in Reid Chapel. No advance tickets are required for the Hymn Sing. Among the many other events during the weekend are a vespers service on Friday evening, a reception hosted by Samford President and Mrs. Andrew Westmoreland, department and organization open houses, and the annual meeting of the Samford Parents Association.